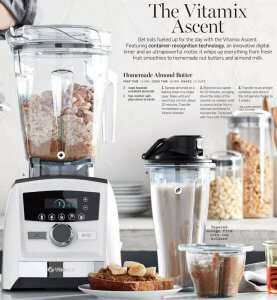 The current Williams-Sonoma catalog includes a Vitamix almond butter recipe in a beautiful Ascent Series spread. As I read it, I kept finding more and more problems. I believe their recipe works, but it doesn’t follow Vitamix best practices and takes considerably more time than necessary. It looks like Williams-Sonoma used a food processor recipe without fully adapting it for a Vitamix. If you have a wide Vitamix container like the one in the Williams-Sonoma spread, 3 cups is not enough nuts for easy blending. (You can use 3 cups of almonds in a narrow Vitamix container, but, at this point, the only narrow Vitamix containers that can be used with a tamper are for Legacy models and don’t work with Ascent models.) For the wide Ascent and G-Series containers, you should use 4–5 cups of nuts. Interestingly, in the photo it looks like they have at least 5 cups of nuts in the container. Next, blending on low speed increases the chance of overheating the motor and makes the process take longer. Finally, if you blend enough nuts to use the tamper, you don’t need to stop and scrape down the sides, and it will blend in about 1 minute, not 10. I am glad to receive this information. I have a vitamix for about 2 years and never used it because I did not know what to combine for healthy smoothies. Thanks so much. 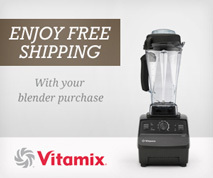 You’re quite right–NOT a good way to use one’s Vitamix and yes, the quantity given is wrong for the model shown. And I learned a trick some years back from a demonstrator named Will who made an appearance at one of our NYC Whole Foods locations. I substitute ⅓ – ½ cup of (raw or toasted) pecans for the same amount of almonds (I put them at the bottom of the container but it’s probably not necessary). The softer, oilier pecans not only facilitate blending but the results are sublime; even better IMHO than straight almond butter. Salt is optional and I like to add just a teaspoon or so of coconut sugar to pull everything together. Yeah, the pecan trick is a good one. I once made 100% pecan butter, and it was delicious, but it was too thin/liquidy to be spreadable. Good grief really – LOW speed! Who in the world came up with that idea? I have been making almond butter for years before it became a national delight. It’s always FAST speed. And yes, the more almonds the better the machine performs. And, for everyone’s info, after scraping all you can of the butter out of the container, put a cup or a cup and a half of your usual drinking water in the machine and run FULL speed for 60 seconds. And woalah! You have fresh, frothie, almond milk that is more delicious than anything else from the stores. or just add some fruit, etc and make a delicious smoothie with the remaining almond butter and you have a delicious fruity drink also….